Normally I don't worry too much about search engine optimization when I write blog posts. My writing is as much for organizing my own thoughts as it is to drive site traffic. My philosophy on search engine optimization is to produce good content and avoid hindering search engines indexing my site. Good content is clear, well organized, and useful. Not hindering search indexes means being text-rich, minimizing broken links, returning the appropriate status codes, and keeping HTML simple. 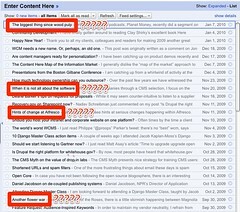 I am not going to trick anyone to come to www.contenthere.net but if I have something that would useful to someone, I want it to be found. After reading the title of a recent blog post ("The biggest thing since wood pulp"), I realized that I was breaking my own very lax rules. My attempt at a pithy title was effectively hiding what the article was about: a possible consequence of the Internet's disruption of the newspaper business. I looked at my recent posts (see screenshot) and realized that I do this quite a lot. One of my worst offenses is "Doubt," which offers an alternative to to matrix-based decision-making. Most people probably assume that I am talking about the movie of the same title. Another example is "Another Flower War", which is about a dispute between Magnolia the CMS and Magnolia the social bookmarking site. I know this title was misleading because I was getting comment spam for garden supply retailers. Pithy titles may be effective in print media when the reader has already made the investment to browse through the publication and is looking for things that spark his interest. They may be marginally effective by causing a curious RSS subscriber to click through. But they are totally counter productive in a search result. Even if the search engine thinks that your article might be relevant to the query, the searcher is likely to assume that your article was listed in error as he scans the results. You have just done the searcher a disservice because you have hidden the answer to his problem. To some extent, some open source projects share in this problem. Sometimes open source project names are taken from an obscure (nerdy) cultural reference or something to do with the history of the project. Sometimes project names are just intended to be fun. I remember an Optaros colleague telling me how silly he felt when he was talking to a CIO and suggested that they use Wackamole for network monitoring. A lot of insiders have to try and recommend a project with a silly name for it to get credibility in the mainstream. Overly clever titles are an inside joke that excludes potential new readers. It's a little like giving a tourist directions that reference where a Dunkin' Donuts shop used to be. These names are useful in getting the attention from the old guard but they exclude the newbies. This may be an intentional community dynamic where new members need to demonstrate their commitment in order to get accepted and longstanding members feel bonded by their shared knowledge. But, if the goal is to bring outsiders in, the name of the project or an article should be clear and not overly silly and obscure.